Australia and New Zealand have always had some very fine crime writers (going back more than a century - the bestselling crime novel of the 1800s was written not by Conan Doyle but a Kiwi lawyer and wannabe playwright and set in Melbourne), but international eyes are turning more towards Downunder lately thanks to the Edgar Award and CWA Dagger Award shortlistings of the likes of Jock Serong, Paul Cleave, and particularly Jane Harper, who won the CWA Gold Dagger last year. Sarah Bailey joins an incredibly strong contingent of female Australian crime writers bringing fresh blood and fresh ideas to the #southerncrosscrime (Australian and New Zealand crime) ranks in recent years; along with Harper, multiple-award-winning Emma Viskic, and Candice Fox, who's collaborated with James Patterson on Australian-set thrillers (Patterson certainly follows the trends) as well as writing her own award-winning series, are particular standouts and relatively new voices. 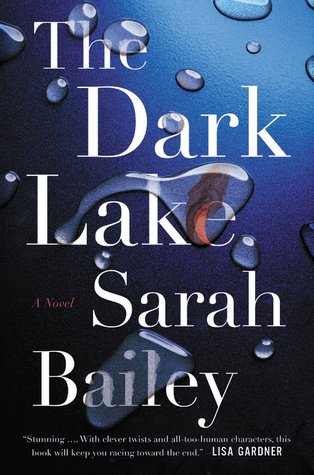 There's a lot to like about Bailey's debut, THE DARK LAKE; it's an interesting and very solid debut from an author who delivers a polished tale and shows plenty of promise. Being hyper-critical, it's not quite the quite a slam-dunk 'oh my God, this is amazing' debut akin to Harper and Viskic in recent years, but that's more to do with the originality of its sublime peers. This is still a good read. 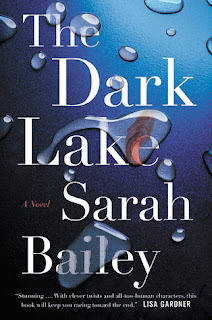 I'm a fan of rural noir, so I was immediately intrigued by Bailey's set-up; the drama teacher of a small town's high school is found strangled in the lake. The lead investigator, Detective Gemma Woodstock, knew the victim back when they were teenagers, setting up lots of that lovely small-town 'everyone knows everyone, lots of past histories but also secrets and things people don't know' vibe. Bailey sets the hook quite well, and I found myself eagerly turning the pages to find out just what happened, while at the same time never feeling quite 'onside' with the main 'hero'. Gemma is a young mother who treats her partner badly, while obsessing over her colleague, with whom she's been having an affair. While Bailey gives us insights into Gemma that make her quite human - and a character doesn't have to be likable to be compelling - I just never quite gelled with Gemma, meaning I was following along the story more out of intellectual interest rather than being fully emotionally engaged. Perhaps a bit nitpicky, because it is a good read, but the balance wasn't quite right for me. Bailey does a great job bringing the Australian small-town to life, the interlocking relationships and the secrets hidden away behind suburban doors. She has a nice touch for setting, and some good characterisation overall, and beyond the main players - which is always great to see. THE DARK LAKE has more of a slow build, getting deeper and more engaging as it goes on, rather than being a page-whipping ripsnorter. I don't mind that, and find myself really enjoying many aspects of the book, while just wishing I engaged slightly more with the main characters. That could have taken the book from good/very good towards great. Bailey shows plenty of writing chops, and she'll definitely be one to watch in future. A good read from another talented Downunder author.